FlexEnable’s glass-free organic LCD (OLCD) delivers high-brightness, long lifetime flexible displays that are low cost and scalable to large areas, with the added benefit of being thin, lightweight and shatterproof. Today, LCD accounts for more than 90% of displays sold, but they are made with glass meaning that they cannot meet the conformability, thinness and robustness requirements in many new applications. By replacing the glass with ultra-thin plastic, and using organic transistors instead of amorphous silicon, FlexEnable has developed the world’s first organic liquid crystal display (OLCD) that can be conformed to surfaces and even cut into shapes. Compatible with existing flat panel display production lines, OLCD is the lowest cost flexible display technology today. It is scalable to large areas while providing high brightness and long lifetime. As with glass-based LCD, the lifetime of OLCD is independent of the display brightness, because it is achieved through transmission of a separate light source (the backlight), rather than emission of its own light. The use of plastic substrates and organic materials, makes OLCD at least four times thinner and ten times lighter than glass-based LCD. Due to its unique properties, OLCD has the potential to transform how and where displays are used in products. It enables new product paradigms and use cases for a range of applications across consumer electronics, smart home appliances, automotive, digital signage and beyond. The video on the left shows an OLCD being conformed to a surface and the video on the right shows a 12.1” OLCD prototype in action. FlexEnable licenses the processes for OLCD production to display manufacturers. OLCD has already been adopted by a leading display manufacturer in China with volume production expected in 2019. OLCD is a cutting edge display technology that enables our partners to create game-changing products and differentiate themselves from their competitors. Based upon FlexEnable’s high-performance OTFT technology, OLCD has the same optical performance as glass LCDs, while removing the constraints of glass and enabling innovative form factors and use cases. 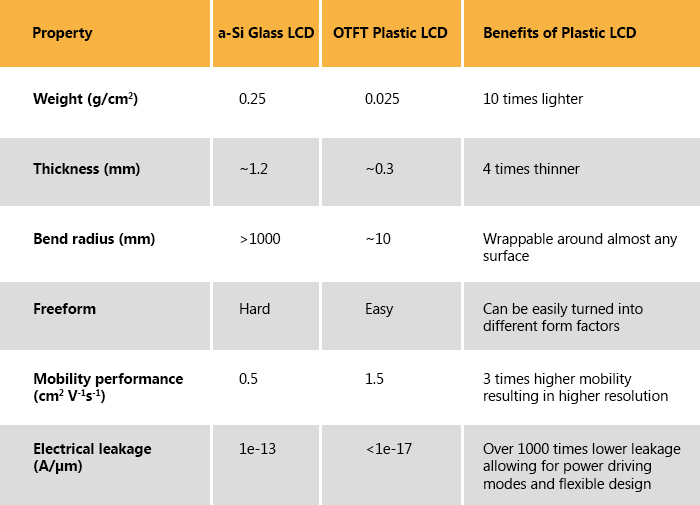 The table below provides a summary of the advantages of OLCD over glass LCD.